As the month of November rolls around, the eucalyptus groves in Morro Bay State Park fill with bright orange monarch butterflies. After soaring the windstreams of the world for over 1,000 miles, these butterflies escape the cold temperatures of the Rockies and migrate to the warmer climates of our central California coast. 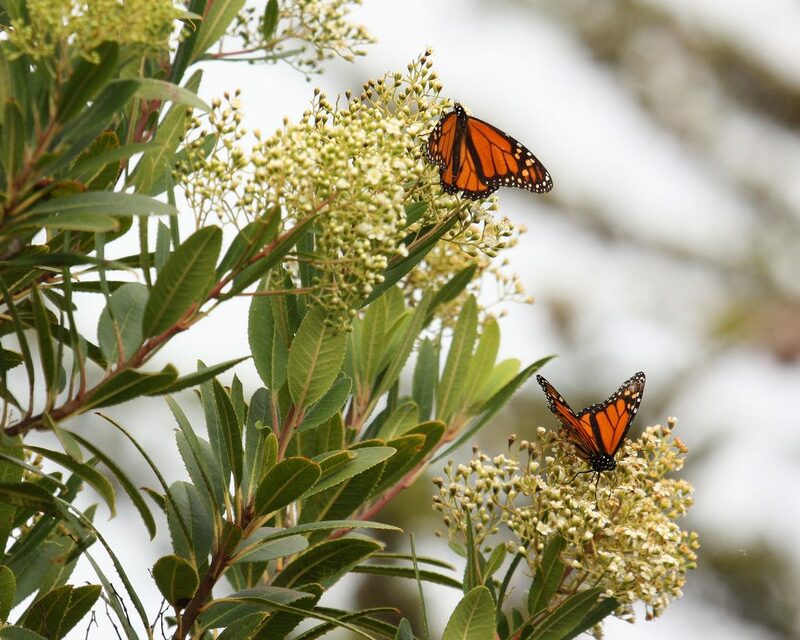 These monarchs were spotted in Montana de Oro State Park, just south of the Morro Bay watershed. Photograph courtesy of Sandy/Chuck Harris, via Flickr Creative Commons license. One monarch butterfly alone cannot make this journey. It can take up to five generations of monarchs migrating southwest before they reach our coast. Depending on the time of year, the lifespan of a monarch butterfly varies. During the spring and summer, monarchs live only two to six weeks. These monarch butterflies are known as the first through fourth generations. The fifth generation of butterflies, also known as the late-summer generation, experiences a much longer lifespan of eight to nine months. Once this generation matures, it embarks upon a lengthy journey. Individual butterflies arrive on the Central Coast from October through December. Unlike the past generations, they do not mate and lay eggs until they have completed this migration. A monarch butterfly rests on the ground in Sweet Springs Nature Preserve. Photograph by Joyce Cory, via Flickr Creative Commons license. Morro Bay’s monarchs tend to cling together on eucalyptus branches, clustering together to protect themselves by overwhelming predators with their sheer numbers as well as shielding themselves from harsh elements. If you go looking for them in the tree boughs, the monarchs’ bright rust-orange color makes them easy to identify. However, it’s best to bring binoculars to get a closer view. Monarch butterflies cluster on eucalyptus leaves in Sweet Springs Nature Preserve. Photograph courtesy of Michael “Mike” L. Baird, bairdphotos.com by Flickr Creative Commons license. A recent study published in Biological Conservation shows that monarch populations in the Western U.S. have plummeted from about 10 million to around 300,000 over the past 35 years. 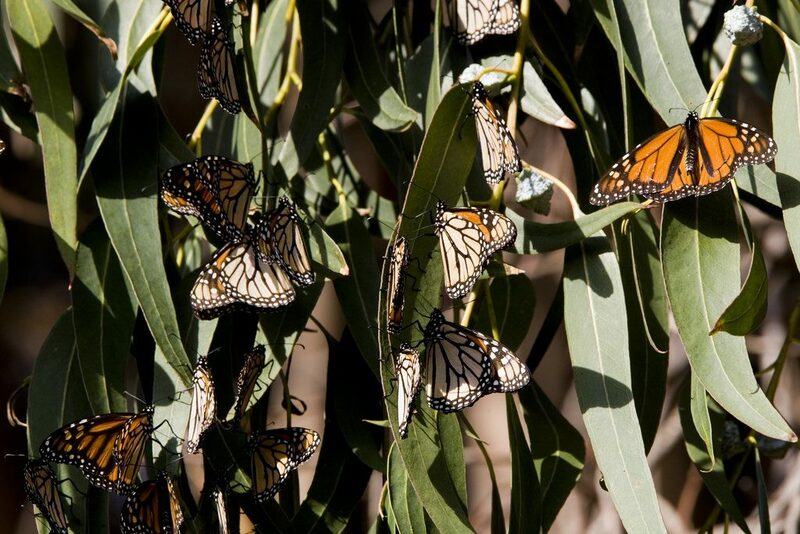 Our local Butterfly Grove in Pismo Beach has also noticed a decrease in its monarch population. For the year 2016, over 20,000 monarch butterflies visited the popular stop. Unfortunately, the next year experienced a drastic drop—only about 12,075 monarchs showed up. This video from KSBY covers the arrival of monarchs on the Central Coast and the decline of monarch populations. One reason for this reduction in numbers revolves around the loss of essential native milkweed plants along the monarchs’ migration path. These plants provide a place for the monarchs to lay their eggs and allow their larvae to feed on of them. Milkweed plants are also a food source for monarch caterpillars. By consuming the milky juice of the plant, caterpillars become toxic for birds and other predators, discouraging their consumption. Native milkweed plants are often cut down due to new development. Fewer milkweed plants means less food for caterpillars, reduced protection from predators, and fewer places for adults to lay eggs. The number of monarchs dwindles in response to these challenges. A monarch caterpillar, or larva, climbs up a Showy Milkweed (Asclepias speciosa). Photograph courtesy of Debbie Ballentine, via Flickr Creative Commons license. 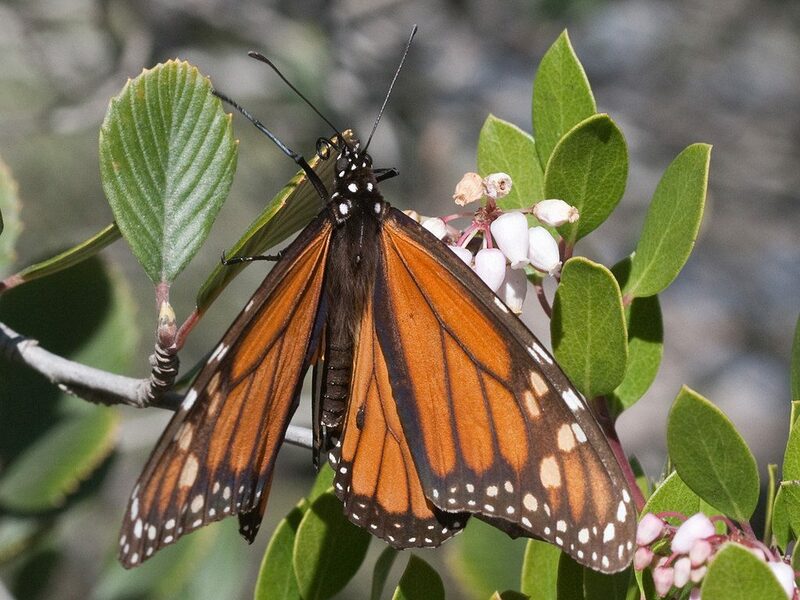 Planting more native milkweed plants in gardens along inland parts of the monarchs’ migration route can be a great way to help support the generations of caterpillars that become the generations of butterflies that, together, make the 1,000-mile journey to Morro Bay and other parts of the Central Coast. Once they’re here, though, the adult monarchs settle in for the winter and need nectar-producing plants—not milkweed—in order to survive. In fact, planting milkweed too close to sites where monarchs overwinter can disrupt their migration patterns, causing them to breed and lay eggs before making the next leg of their journey. 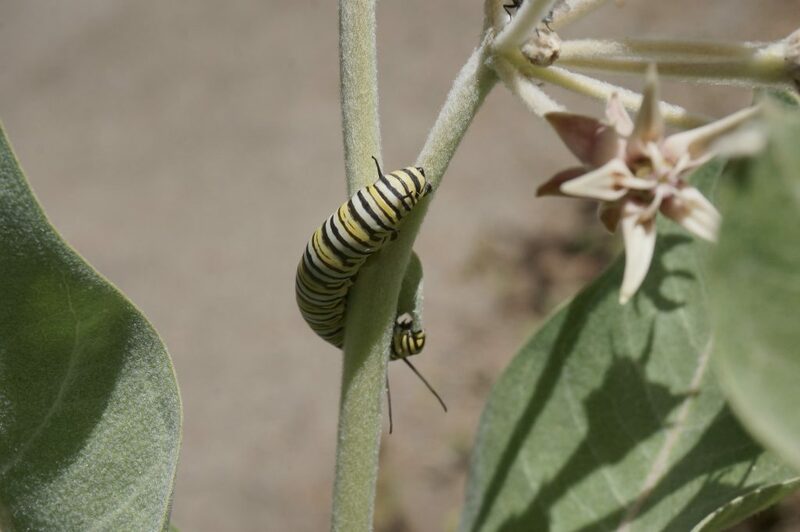 To help avoid this problem and keep the monarchs’ natural migration pattern in place, experts recommend not planting milkweed within ten miles of any place where monarchs come to spend the winter. Instead, plant native, nectar-producing plants that can support adult monarch butterflies and other native pollinators like hummingbirds and bees. Monarch butterflies need nectar from California native plants, like the manzanita blooms on the right side of this image. Photograph courtesy of JKehoe_Photos, via Flickr Creative Commons license. 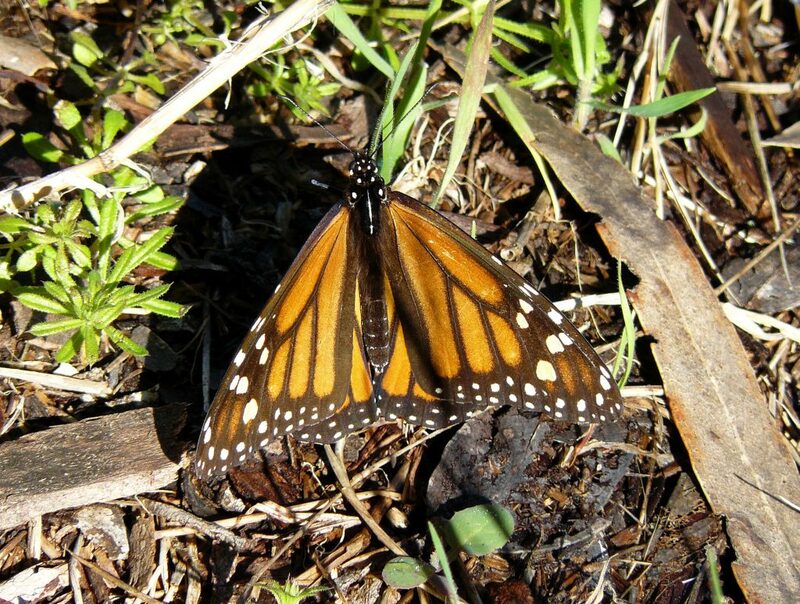 Morro Bay’s monarchs will be here until late February. Some of the best locations to spot these incredible insects are the Morro Bay State Park, Morro Bay Golf Course, and Del Mar Park. Don’t forget to bring your camera and binoculars! If you venture out to see the monarchs during the three weeks surrounding Thanksgiving (November 10 through December 2, 2018), you can count the butterflies you observe and send your data to the Xerxes’ Society‘s Western Monarch Thanksgiving Count. This is a great Citizen Science project that the whole family can help with. Tess is a Morro Bay native who has always loved the estuary and the wildlife that call it home. She is a Biology Major at Cuesta College and wants to pursue a career in Environmental Management and Protection. Tess also enjoys writing, kayaking, and volunteering in the local community.